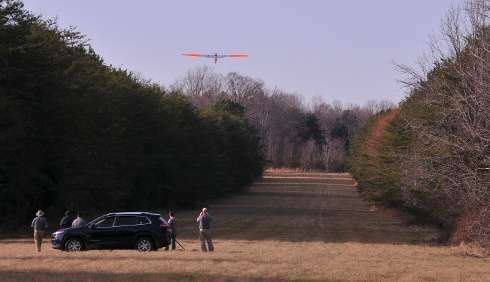 The first Mid-Atlantic Aviation Partnership at Virginia Tech test flight using a fixed-wing unmanned aircraft to inspect an energy pipeline route—with a piloted chase plane following behind to ensure safety beyond the ground observers' sight line —was completed last week. The flight was a step toward making aerial inspections of energy pipelines safer and more economical, researchers say. The flight lasted about 90 minutes and covered about 11 miles over a Colonial Pipeline Company right of way near Fork Union in rural Virginia. 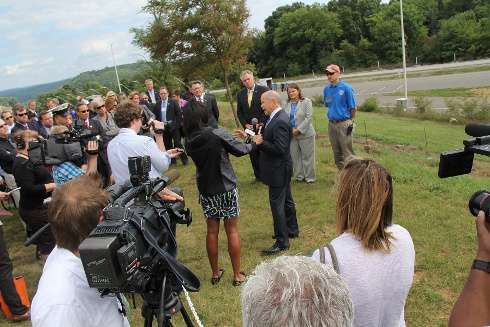 The mission was overseen by the Mid-Atlantic Aviation Partnership at Virginia Tech and supported by the Pipeline Research Council International, a collaborative research arm of the energy pipeline industry. 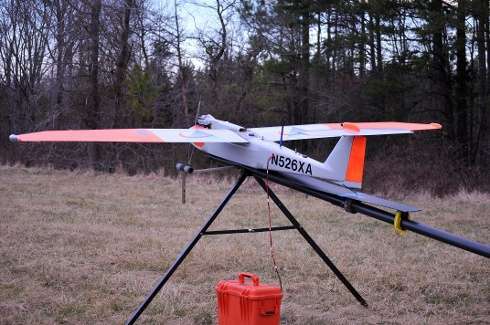 American Aerospace Technologies Inc., a Pennsylvania-based company that creates Unmanned Aircraft Systems for industry use, provided and piloted the test aircraft—an RS-16 UAS, which can be equipped with a special sensor package to identify threats to pipeline integrity. A piloted chase helicopter followed the unmanned aircraft for safety purposes. "Aerial inspection of energy pipelines is federally required and typically performed using manned aircraft flying at low altitudes," said David Yoel, chief executive officer of American Aerospace Technologies Inc. "If we validate unmanned aircraft technologies, we can reduce risks to pilots and the public, and more efficiently protect the country's critical infrastructure." Results thus far show that it is possible to use unmanned aircraft to conduct pipeline patrols, Yoel said. Ultimately, the Federal Aviation Administration will decide whether unmanned aircraft operations for utility inspections have met safety standards. Virginia Tech, with academic partners Rutgers University and the University of Maryland, operates one of six FAA-approved unmanned aircraft testing programs in the nation under the banner of the Mid-Atlantic Aviation Partnership. 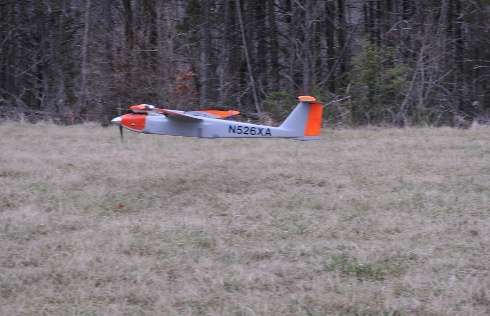 "This is important because it represents one of the first chase plane flights using a fixed-wing unmanned aircraft system for infrastructure inspections," said Rose Mooney, executive director of the Mid-Atlantic Aviation Partnership, headquartered at Virginia Tech's Institute of Critical Technology and Applied Science. "We received permission from the FAA to oversee flights of the unmanned aircraft with a chase plane. Chase aircraft observations will provide the FAA and the pipeline industry with a better understanding of UAS flight safety requirements for flights that involve long duration and great distances, such as pipeline inspections." The research is part of Pipeline Research Council International's Right Of Way Automated Monitoring (RAM) Project, which is looking at innovative technologies to improve and automate pipeline monitoring in the United States and internationally. Energy pipelines are mainly buried underground. Damage may inadvertently occur during land-clearing, construction, or farming work. One of the objectives of the RAM project is to enhance aerial surveillance of the right of way through unmanned aircraft and other techniques, with the ultimate goal being continuous, real-time detection and reporting of machinery threats to pipeline integrity. "As an entrepreneur who has been dedicated to using unmanned aerial technology to inspect infrastructure since 2008, it is my hope it can be used in remote and rural areas as early as 2017," Yoel said. "We need to do more work and additional testing to make sure we can deliver this service. I believe it is possible to improve safety and efficiency above today's levels." Organizers say a new round of testing will be underway later this spring. The RS-16 aircraft has a wingspan of nearly 13 feet, a 25-pound payload capacity, and is capable of flying more than 12 hours before refueling. During future flight tests, the aircraft will be equipped with mapping capabilities and a sophisticated sensor package to detect threats to the pipeline.